DESC: SPATULA PP 4.5 in. length (115 mm). These polypropylene spatulas are autoclavable and have excellent chemical and heat resistance. Virtually unbreakable. Spatulas retain their original shape after flexing. Suitable for use with food products. DESC: SPATULA PP 6.5 in. length (165 mm). 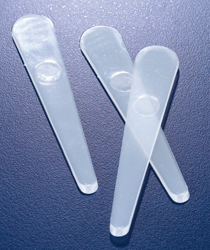 These polypropylene spatulas are autoclavable and have excellent chemical & heat resistance. Virtually unbreakable. Spatulas retain their original shape after flexing. Suitable for use with food products. DESC: SPATULA PP 10 in. length (252 mm). These polypropylene spatulas are autoclavable and have excellent chemical and heat resistance. Virtually unbreakable. Spatulas retain their original shape after flexing. Suitable for use with food products. DESC: SPATULA PP 8in. length (200 mm). These polypropylene spatulas are autoclavable and have excellent chemical and heat resistance. Virtually unbreakable. Spatulas retain their original shape after flexing. Suitable for use with food products.